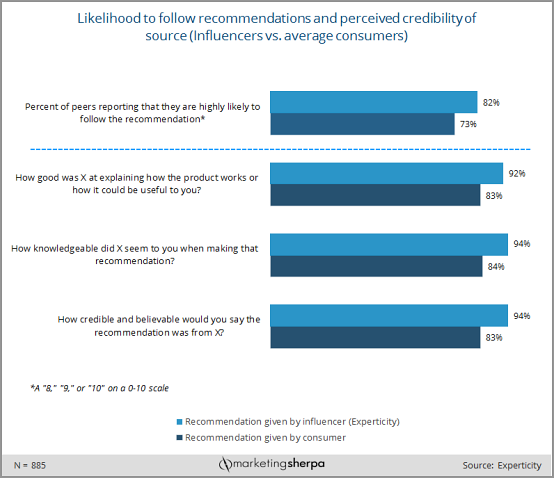 Marketing Research Chart: How likely are consumers to follow influencers' recommendations? SUMMARY: Influencer marketing has become a buzzword, with Google searches rising 69% since May 2015. However, there isn't much research published on its effectiveness. This week, we look at a study exploring how likely consumers are to follow influencer and customer recommendations, and how marketers can incorporate influencer marketing into their toolbox. It's clear that word-of-mouth has tremendous appeal to marketers due to people trusting people more than they trust ads and companies. However, not all word-of-mouth is created equal, and not all recommendations will have the same swaying power. This week, we look at a study that quantifies consumers' likelihood to follow buying recommendations from influencers and average consumers, and how marketers can successfully utilize word-of-mouth from microinfluencers. On March 30, 2016, Experticity, an influencer marketing company, released the results of a study conducted in collaboration with Keller Fay Group and Dr. Jonah Berger, The Wharton School of the University of Pennsylvania. The researchers surveyed 6,022 U.S. individuals, both microinfluencers and average consumers. To assess the impact of participants' recommendations, they also asked 885 people who received recommendations from microinfluencers or average consumers, how likely they were to follow the recommendations. According to Experticity, microinfluencers are not traditional celebrities, but rather individuals who work in their category, or are truly knowledgeable, passionate and authentic, as well as seen as a trusted source of buying recommendations. Perhaps not surprisingly, more people were willing to follow an influencer's recommendation (82%) than an average customer's recommendation (73%). However, 73% for the customer recommendations is still a notable majority, illustrating once again the power of customer word-of-mouth. It is important to note that, according to the study, influencers give recommendations much more frequently (up to 22.2 times more each week), and give more direct, "buy it, try it," recommendations than the average customer. That's up to roughly 22 recommendation conversations per week from an influencer, which demonstrates the significance influencers hold for marketers. Who are these influencers, and how can marketers learn from these findings to successfully integrate them into their strategies? Inga Johnson, Senior Vice President of Brand and Marketing at Experticity and Dr. Jonah Berger, Associate Professor of Marketing, The Wharton School of the University of Pennsylvania, shared the following three points of advice. Johnson stressed that microinfluencers are so valuable for marketers, because customers trust them due to their passion and deep knowledge in the category. To garner the trust-building benefits influencers can bring, Johnson cautioned marketers to avoid common mistakes like working with the wrong kind of influencers, or trying to buy a specific recommendation without disclosing the sponsorship. "The folks that are most valuable, are trusted by a consumer because they have a real, credible voice in their category," Johnson said. "These folks will ask for a deep relationship with the brand and understand the products prior to recommending." Additionally, Johnson cautioned that paid or inauthentic influencer marketing campaigns may be quick to execute but may not help your brand win the trust of customers. Johnson also added that the drawback of using real-life influencers is that these kinds of influencers can be really difficult to find in scale. Since people generally have low trust in paid messages like ads, the issue of paid relationships with influencers is a sensitive one. Berger noted the value of word-of-mouth is that it seems unbiased. He added that consumers want to make sure that the information they're getting is as valuable and objective as possible. Johnson stressed that brands should be transparent about any paid relationship with influencers. "A paid relationship does not always equate to a lack of authenticity," she said. "If someone is truly passionate about a product and category, that authenticity will show. Telling how you received the product (if free) is part of what keeps that authenticity alive." Johnson said she sees influencer marketing — and marketing in general — continually evolving to reach consumers in more authentic and trustworthy ways. She noted that some marketing firms undercut customer trust through undisclosed relationships and endorsements. As a consequence, Johnson advised, "The best thing marketers can do is to broaden their tactics so that they win back consumer trust and allow influencers to provide authentic buying recommendations to the consumers looking for a trusted opinion on what to buy." Berger noted that he would like to continue exploring how people share word-of-mouth opinions online vs. offline, whether people share different things when talking with just one person vs. a large group, and how sharing word-of-mouth helps consumers reach different goals.